The Atom Professional Lawn Edger 560 is the professional lawn edger constructed by Atom for commercial and heavy duty use. The Honda GX35 engine ensures that your Atom edger is easy to start and very fuel efficient. The light weight design accompanied by the full anti-vibration handles means that your Atom edger will be extremely comfortable to use for long periods of time. It durable design and manoeuvrability guarantees the ability to do almost any lawn edge you encounter with precision. The four stroke Honda engine removes the hassle of fuel mixing meaning you can spend more time getting the job done then spending time preparing your edger for work. 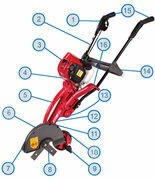 So call into Henderson Mowers & Chainsaws today to purchase yourself a profession Atom lawn edger. 3. Honda GX 35cc four stroke commercial engine. 13. A reinforced high grade strength Polyamid casing which can withstand 680kg of weight. 14. A cross frame to ensure added stability to your Atom machine. 15. For operator comfort the Honda deluxe has air cushioned bio-rubber handle grips. 16. Anti-vibration handle system which ensures operator comfort by minimising fatigue when using the Atom edger over long periods of time.